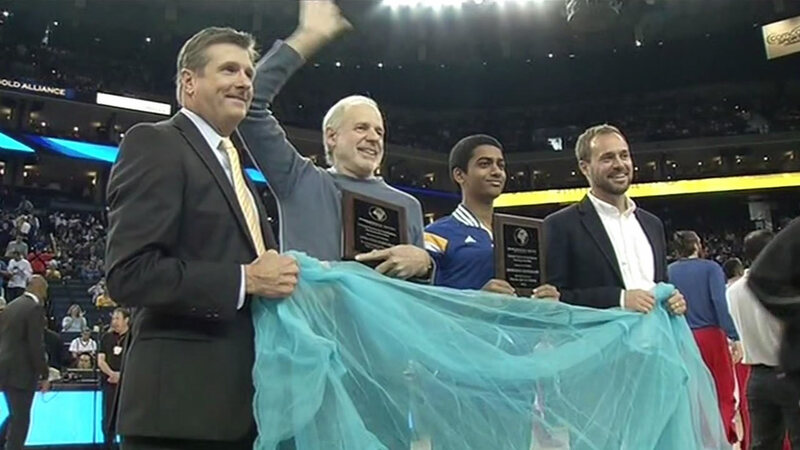 WASHINGTON (KGO) -- The Nothing but Nets campaign group and the Golden State Warriors teamed up to help fight malaria during Sunday's game. Nothing but Nets donates life-saving mosquito nets to fight malaria in Africa. Before the game, a Union City High School student named Aniruddh Mandalapu received an award for raising thousands of dollars for the cause. "One child dies in Africa every 60 seconds, so in a class period of 85 minutes, 85 kids die. And just to make a difference with one or two bed nets, to save two to three kids lives and a family, it's a big deal," he said. Warriors star Stephen Curry is a big supporter as well. He was at the White House in February to support the nation's 10-year initiative on malaria, which is something he's passionate about. Curry has been active in efforts to reduce deaths since his college days. And as a Warrior, he's made a pledge to send three nets for every three-pointer he makes. Curry actually went to Tanzania in 2013 to hand out those nets treated with insecticide. He's partnered with a United Nations Foundation program called Nothing But Nets. When he returned from Africa he explained how they work on Good Morning America. Golden State Warriors guard Stephen Curry appeared on Good Morning America to explain how nets treated with insecticide work in the fight against malaria. While underneath the net Curry said, "Imagine were in a bed right now. We're protected right? So the mosquitos can't get through." "The reason we do what we do, Stephen and the Nothing But Nets campaign, is because a child still dies from this disease malaria, which is totally preventable," said Nothing But Nets Director Chris Helfrich. Curry's pledge to donate three bed nets for every three-pointer he makes is matched by the Warriors and has meant more than 2,300 of the lifesaving nets over the past two seasons. The team donated a portion of Sunday's ticket sales to help fight malaria.